"Now arriving on track 3, Methodism in Ogden." While that wasn't the call heard in the Union Pacific and Southern Pacific passenger terminal on June 28, 1870, that was what was arriving as the Reverend G.M. Pierce conducted the first Methodist church service in the terminal. The ministry of what is now First United Methodist Church was launched on an express run that saw the congregation literally on the move for the first few months of its existence, meeting for short periods in the Ogden Theater Building at the corner of 24th and Grant ($5 per week), Cordon's Hall at 25th and Main (now Washington Avenue) ($12 per month) and Leavitt's Hall at 24th and Washington ($18 per month). Looking for a more permanent home, in June of 1871, the church purchased property at 2364 Washington for $1700. From its beginnings as a missionary project of the Methodist Episcopal Church receiving most of its financial support from the Church Extension Society, the Board of Missions and Church Extension, and from individuals in several eastern states, the church grew both in size and in missionary spirit. Under the leadership of Rev. L.W.B. Long, the church began its long history of community involvement and outreach by expanding its ministry into the community by purchasing a small adobe building near the church and adapting it for school use. 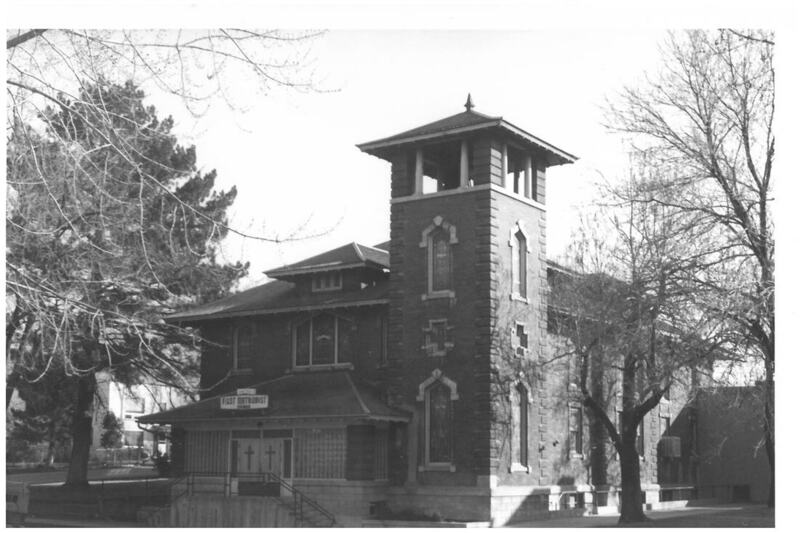 Some 60-80 pupils, both Mormon and non-Mormon, attended this very successful first Protestant church school in the Ogden area. In 1875 the cornerstone was laid for the Methodist Mission building (shown here), dedicated in 1876, providing the first permanent housing for the First Methodist Episcopal Church. A second Methodist Mission was built later in the Five Points area. Cashing in on the prosperity that hit Ogden in the late 1880's and seeing the need for more room, the church sold its property on Washington Avenue for a substantial profit, then bought a lot on 24th Street just above Washington, and embarked on a $25,000 building project. The cornerstone was laid on Decoration Day 1889 and it was hoped that the building could be completed within a few months, free of debt. However, enlargement of the original plans plus inflation costs for materials and labor pushed the cost of this edifice to $65,000. When the "boom" ended suddenly in the fall of 1892, the church found itself in trying times. Debt hung over the church like a gloomy pall until it was finally paid off in 1906. During this period pastors changed almost annually. In fact, one stayed for three months and left with nervous prostration and another stayed but three weeks. But with the advent of the 1900's, stability gradually returned and pastorates became longer. In 1890, the church purchased a two manual/seventeen rank pipe organ from the Farrand and Votey Pipe Organ Company of Detroit, Michigan. It boasted a tubular pneumatic action, its 926 pipes supplied air powered by healthy and strong young men of the congregation. Now and then a "pumper" would literally fall asleep at his pumping station and the magnificent organ would fall silent--often at inopportune times. The organ became quite a point of interest to passing tourists in its early years. Travelers often had extended "layovers" at Ogden's Union Station, and would be sent to see the "magnificent and massive" pipe organ in the Methodist Episcopal Church. Perhaps, if they were lucky, they would hear the organist practicing voluntaries for the next Sunday's church service. Much to the organist's delight, the sometimes unreliable manual pumpers were replaced by electric blowers in 1920, greatly relieving the stress level of the organists. Seeing the need to provide a safe Christian environment for young working women in the area and continuing its dedication to Christian service, the church, in 1914, purchased a house at 2322 Jefferson and opened the "Sterling Young Women's Hall" which, in 1936, took the name of Esther Hall. For several decades, until 1978, Esther Hall provided a home for up to twenty-three young ladies. After 35 years' use, the church on 24th street needed repair so extensive that it was deemed wiser to invest the estimated cost of repair in a new church on a new site. In May 1925, the James Pingree property on the corner of 26th Street and Jefferson Avenue was purchased for $27,000. The three story residence, and adjacent gymnasium, with swimming pool, shower baths, and club rooms, was extensively repaired and adapted to serve as a temporary church, parsonage, and Sunday School classrooms. From that time to the present this residence has been known as "The Community House." The Rev. Lester Fagen and the church trustees envisioned a church to be built east of this residence and ground-breaking for the present sanctuary was in March 1928. Rev. Fagen was the building's principal designer and architect. The cornerstone was laid in September was completed that year and dedicated in April 1929. 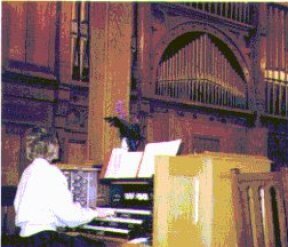 During the relocation, the massive pipe organ in the 24th Street church was disassembled and it and the pews were moved piece by piece on wagons to the new building. Church records indicate that "such a massive effort required [many] volunteer hours." Careful storage of the organ's many components was necessary until the new sanctuary could be completed. The organ was erected in its present location by the Schoenstein Company of San Francisco, complete with a new console and the partial electrification of its action. During the succeeding decades, the congregation grew to more than 400 families. To meed increasing needs, in 1956 the church bought two lots south of its property and prepared to remodel part of the church building and the Community House, erect an educational building, and provide a paved parking lot. Ground was broken for the new building on February 19, 1961, and the project was completed late that summer. The Educational Building included a new kitchen, Fellowship Hall, and classrooms for the Church School. This project necessarily included demolition of the church garages and old gymnasium and the leveling and paving of the parking lot. The debt for this project was retired in 1969 in time for the centennial celebration in June 1970. Since the entire Community House was required for office and classroom space, the church purchased a residence at 1665 Capitol for use as its parsonage. The Rev. H. Preston Childress was the first pastor to occupy the new parsonage. In the summer of 1964, the chancel area of the sanctuary was modernized and enlarged to provide more room for the choir and speakers and a longer altar rail was installed. The following year, the organ was completely electrified. Two further additions were made to the property. First was the 1968 purchase of the property immediately east of the church which provided needed additional parking space. The house was torn down in 1973 and the parking area leveled and paved in 1974. At the same time, a new entry built on the east side of the Fellowship Hall provided "wheelchair" access to the educational building and the sanctuary. By 1965, the organ, which was by then seventy-five years old, was in desperate need of a new console and major repairs. The chests were wearing out, and many ranks of pipes were either missing or in a bad state of repair. In the late 1980's, a committee, under the leadership of Vern C. Blair, was formed to guide the renovation of the organ. The organ was expanded from the original two-manual instrument to its present three-manual, thirty-five rank state. The original stop list was followed as closely as possible, and nearly all pipe additions, as well as replacements were completed with vintage pipework acquired by the church during the renovation project. First United Methodist Church has a long history of dedicated Christian service dating back to its very beginnings. It has served as a teaching congregation, hosting eight pastoral interns, providing valuable experience and loving care during their seminary training. First's commitment to compassionate outreach has taken many forms, from the many projects mentioned above to a soup kitchen begin by King and Eppie Hastings, two dedicated members of the congregation, to a 60's youth coffee house begun by Carol and Jim Jensen. In addition, First UMC was instrumental in the founding of the Family Counseling Service in 1965, and in the development and expansion of St. Anne's Center for the Homeless. For a time, the church also served as home for the Korean United Methodist congregation of this area. The 125 year history of First United Methodist Church was one of service and compassion. As it stood on the threshold of the twenty-first century, the church was poised to reach out into God's creation, ministering to the "least of these," and responding to Christ's great commission to go into the world and make disciples. Listening to the historic beginnings of First UMC in the Union Station passenger terminal, one could almost hear the conductor saying, "All aboard," as we prepared to move with the Spirit of Christ into the future. After much prayer, persuasion, and planning, the FUMC congregation voted to move away from the downtown location. FUMC purchased land on 400 N. in Marriott-Slaterville and built a brand new church. With the h﻿elp of Bertoldi Architects, Kier Construction, Wells Fargo, and Bank of Utah, the many years of the generosity of the faithful and saving, saving, saving, we moved to our present location in April/May 2008. How exciting to have central air conditioning, modern furnaces, and room to run around and play outside! Our ministries now include a community garden and a beekeeping, as well as a supportive relationship with the nearby George E. Wahlen Veterans' Nursing Home. 2018 is our Tenth Anniversary in Marriott-Slaterville! We're celebrating our tenth anniversary here with a "History Highlights" time during worship on the fourth Sundays of the early months of 2018. We will celebrate Heritage Sunday in style on May 27. Click here for a 2016 Heritage Sunday photo. The church at 2364 Washington Ave.
FUMC at 1339 W. 400 N.